When it comes to offering the best dining experience to the guests in a hotel, a clean and good quality table cloth plays an important role. 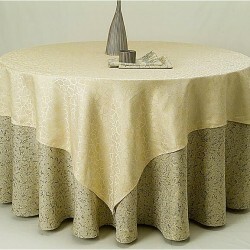 Luxurious table clothes can truly enhance the appearance and feel of a dining space. Quality table cloth is measured by GSM value, could be customized between 180GSM and 200GSM. These table clothes are not just grease-proof, but stain-proof as well. The size of our table clothes is 160 x 160 cm; but you can get the size customized as per your needs. Plus, you can also order rolls of table cloth. Why go for our table clothes? Our company, Petop Hotel Supply has successfully earned a huge base of satisfied clients from the hospitality sector thanks to the affordable wholesale price.